Coleman RoadTrip LXE – ideal for tailgating, picnicking, and camping. A griddle is one of the most important elements that you can add to a Coleman grill. A high quality cooking griddle can make it easier to cook your favorite foods, it can be practical with a design that prevents food dropping, and a griddle can even change how well your food is cooked. 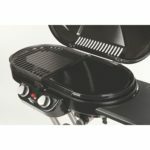 If you need a replacement Coleman grill stove griddle, or if you want to add a griddle to your standard grill, then you’ll need to take a look at what’s on the market today. Let’s take a look at different types of griddles, as well as options for your favorite Coleman grill. What’s the Difference Between a Griddle and a Cooking Grid ? Most portable grills come with a cooking grid that allows for direct flame grilling. A cooking grid is often preferred by grilling enthusiasts because it allows for charring of your food. However, when you are using a portable grill, a cooking grid won’t always be practical. Griddles have a solid surface that can allow for more cooking options. When you are camping, tailgating, or road tripping, you will want to keep your cooking accessories to a minimum. Because a griddle can act like a frying pan or skillet, you will be able to travel light while saving space. 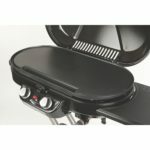 If you have a Coleman RoadTrip grill, then you will be able to find direct drop-in griddle replacements. These are convenient for camping and can make your grill more versatile. Coleman produces this Swaptop Porcelain Coated Cast Iron Griddle which can be used alongside your standard cooking grid. This is a popular option because it only covers half of the cooking surface. This means that you will be able to use your portable grill just like a large freestanding home grill, with different cooking surfaces on either side. 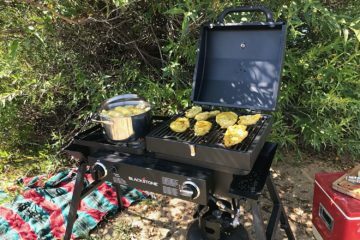 Whether you are looking to fry eggs and pancakes while camping or road tripping, or even if you want perfectly seared steaks and burgers, this is a great investment to make that will help you get the most out of your RoadTrip grill. This griddle is made from cast iron, which can provide excellent heat retention and consistent heat across the entire surface. The porcelain coating adds non-stick properties to the metal, and prevents rust while prolonging the lifetime of the cooking surface. If you want to replace the entire grilling surface with a griddle, then Coleman makes an Aluminum Full Size Griddle for the RoadTrip models. This option covers the entire 285 sq. ft. of cooking space, and features a convenient design with a grease collection area. This griddle is made from aluminum so it can heat up quickly for fast cooking sessions. Although aluminum doesn’t retain heat as well as cast iron, it’s still a good option for a portable grill. There are cooking griddles available for other Coleman models, including the triton propane stoves. These stoves are popular for camping, tailgating, and road tripping, but are not as versatile as a grill. By adding a griddle to your Coleman stove, you can cook your favorite BBQ foods. This Coleman griddle is made from high quality steel and features raised edges to keep grease on the griddle. Cleanup is easier and this can be used with a range of dual-burner camping stoves. 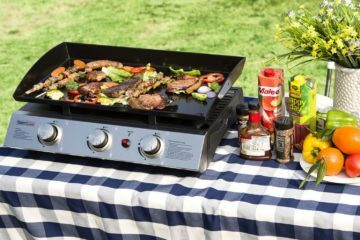 This Coleman Triton series griddle is another great option that turns your dual burner stove into a versatile camping grill. It features a raised lip for mess-free and effortless griddle cooking. Although designed specifically for the Triton series, it can be used with a number of stoves and grills that feature a dual burner, rectangular design. 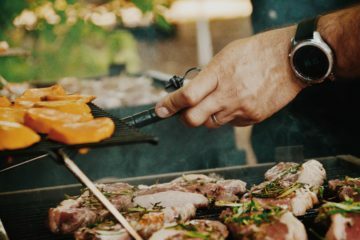 By upgrading your grill or stovetop with a griddle surface, you can get versatile cooking wherever you are, whether that’s on the road, the campsite, or even in your own backyard.